Environmentalists have filed a lawsuit to stop a U.S. Army Corps of Engineers beach-protection plan in Montauk that they argue will actually worsen erosion along a fragile ocean beach. Defend H2O, a nonprofit based in Sag Harbor, and a group of supporters filed the suit Friday in State Supreme Court in Riverhead. They want to block the emergency plan, which would bury 14,000 sandbags each weighing 1.7 tons. They claim that the massive "geotextile" bags, if exposed by a storm, would act as a hard wall that causes the ocean to scour away sand. Scientists have argued that hard structures meant to fortify a beach can worsen erosion by reflecting waves instead of letting them disperse on the shore. "This is shore-hardening structure," Defend H2O founder Kevin McAllister said Tuesday of the bags. "When they're packed with sand they're like concrete." Army Corps officials have said that the geotextile bags, which would be covered by 3 feet of sand, would act like a natural dune, not a hard structure. 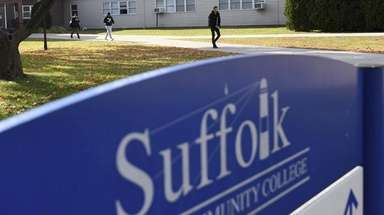 East Hampton, Suffolk County and the New York State Department of Environmental Conservation are also named as defendants in the suit. The suit also argues that the project violates East Hampton Town's shoreline regulations, which bar hard structures from ocean beaches. 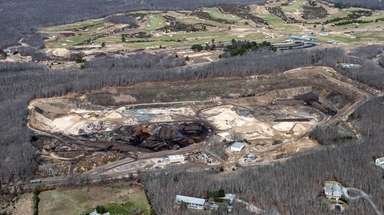 "The town will work with the county, the state and the Army Corps to vigorously defend the litigation," East Hampton Town Supervisor Larry Cantwell said Tuesday. The lawsuit was filed the same day the Army Corps hired H & L Construction to execute the $8.4 million project, which is designed to secure an erosion hot spot in front of a row of hotels. Corps officials did not respond Tuesday to a request for comment. The 3,100-foot stretch of beach has sustained years of erosion that worsened after superstorm Sandy in October 2012. East Hampton officials and Montauk hotel owners have said the project is vital to protecting the hamlet's downtown from a potentially devastating storm surge. Army Corps officials have said the project is designed to protect Montauk while they develop a Fire Island-to-Montauk Point flood-protection plan spanning much of the South Shore. McAllister said he favored a "retreat" policy of governments buying up vulnerable waterfront properties and returning them to nature. "There seems to be a propensity to advance coastal armoring in lieu of developing a thoughtful strategy to retreat," he said. "I think this is a losing prospect to continue to put these structures out there." Rep. Lee Zeldin (R-Shirley), a supporter of the project, said he would work to get it completed. "The Downtown Montauk Project is essential to the East End of Long Island by providing vital shoreline protection to our community," he said. "I will continue to work closely with the Town of East Hampton and all parties involved to help protect Montauk residents and businesses from Mother Nature."